If anyone on the team deserves it, it’s Daniel. He has been no less than amazing this year He would be under Outfielder. Yesterday, I spent quite a few hours watching sports on television. Tennis in particular. Men’s tennis, specifically. Normally, I don’t go in for the men’s tennis. I don’t know why except I don’t like the track it’s taking with the machismo aspect of their play. Tennis used to feel like a much more “civilized” sport to me, and I enjoyed watching more then. But these days, it’s both the men and the women who have pumped up their bodies (I cannot believe some of them don’t use steroids especially one woman in particular of whom I am no fan and who happened to win the French Open today!). They have ramped up the grunting to ear-piercing noise and that bothers me a lot. Even the men are now into that habit. They must think it makes them sound more manly. It doesn’t. Tennis I don’t believe was ever meant to be a machismo sport. Hitting a ball over a net… c’mon guys and gals! It’s a great skill to do what you do, but the pumping up and pounding the chest thing is very distasteful to me. So yesterday I watched two men’s tennis matches. The semifinals. Unlike with most matches I watch, both of the men I was rooting for won. Rafa Nadal and David Ferrer will play each other tomorrow in the French Open Final. Yay. A good day for me. The night before that, my baseball team surprised us all by winning the game against the Texas Rangers in the last of the 9th inning when our Big Papi (David Ortiz) stepped up to the plate with 2 outs and 2 men on base, and hit a home run that felt like the last game of a World Series. The score had been tied 3-3, so with his walk-off 3 run home run, we won. We took 2/3 against the Texas Rangers. So here we are today, all settled in for some more sports. Tennis at 9 a.m. I arose a little late today, had a toss-and-turn night, and got down here to see the first of the Women’s Finals – SerenaWilliams vs. (my pick of) MariaSharapova. This is where my luck has changed. Maria got flounced. 6-4, 6-4. Now I’m watching Red Sox baseball. We had to cancel last night’s game due to rain, so today they will play a double header at Fenway. The sun is out, it’s a beautiful day for a baseball game. I’m all settled in to my chair, lunch finished, and am watching the game… all should be right with the world. The Sox are losing to Los Angeles 3-1 so far. Granted it’s only the 4th inning, but still…grrrrr! Oh, just as I wrote that, an LA player flubbed the ball and we scored another run… yay! it’s 3-2 now… and we still have a man on base and Dustin Pedroia is up. So that’s all I’ll write. 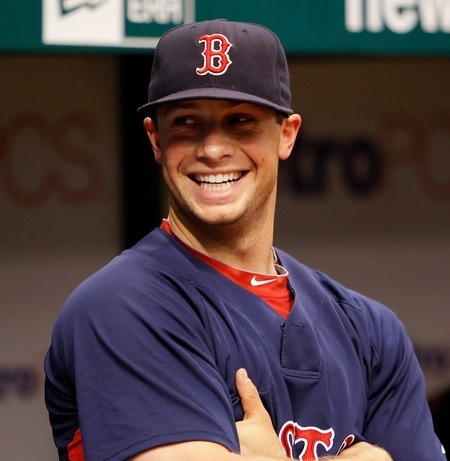 Oh, my favorite player, Daniel Nava, just stole second base! Reenie, I also wish I’d kept up with my piano lessons as a child. It’s the one instrument I would love to be able to play. I played guitar for years but never could do piano. My brother and I had lessons but we quit when my mother went away on a holiday without us. I even bought an upright piano when I was in between husbands and living on my own… it sat there in my apartment for years and I finally gave it away. The cat would tinkle the ivories more than I ever did! So often I’ve wished I’d developed an interest in spectator sports but never have. And now that I don’t have cable, it will never happen. Kind of like I wish I’d practiced piano all those years I took lessons. Yet, I enjoy your enthusiasm so much! I will continue to root for the underdog when I can, but Rafa is a true athlete, appears humble, and he gave his winner’s speech in three languages – English, French, and then Spanish. He’s a goofy kind of guy but so talented and so determined. A good French Open all except for the women’s side. Blech. Not much of a TV watcher here. I suppose if I lived in a colder climate I would be more of a fan. Basketball would be my choice, unless the broadcasters would include surfing, which would then be my first choice. I agree with all you said Mike. I am hoping some new blood will emerge in tennis, however, I love Rafa Nadal so he can stay! But Ferrer is great and he’s so much more “humble” than the others… I am so glad Federer is waning now, and I know Djokovic isn’t waning but he’s too cocky for me. He tears off his shirt when he wins and parades around like a peacock. I hate that. I like humility. Ferrer is the epitome of humility. I started watching tennis when Stan Smith and Arthur Ashe were the stars of the gentlemen’s game. (That’s still what it’s called at Wimbledon, I think.) Then Jimmy Connors and John McEnroe brought personality to the sport. I was a big fan of Connors, mostly because he didn’t have raw talent but worked hard and never gave up, no matter how far down he got in a match. For most of the last decade there has been a spirited four-way rivalry amont the only players who were consistent winners in big tournaments: Federer, Nadal, Djokovic and Murray. Maybe David Ferrer will crack the Mount Rushmore of men’s tennis, but I don’t see anyone else come along. I enjoy watching women’s tennis also, but sometimes I have to mute the sound on the TV. I can only take so much screeching. I don’t know why the powers that be allow that to go on to the extent that it does. So… the Sox lost one and won one. It’s tough to play two games in one day, but it beats playing indoors to avoid rainouts. That is a lot of sports. But then I have been watching what I can. I do hope the Soxs win as they have been doing so well.